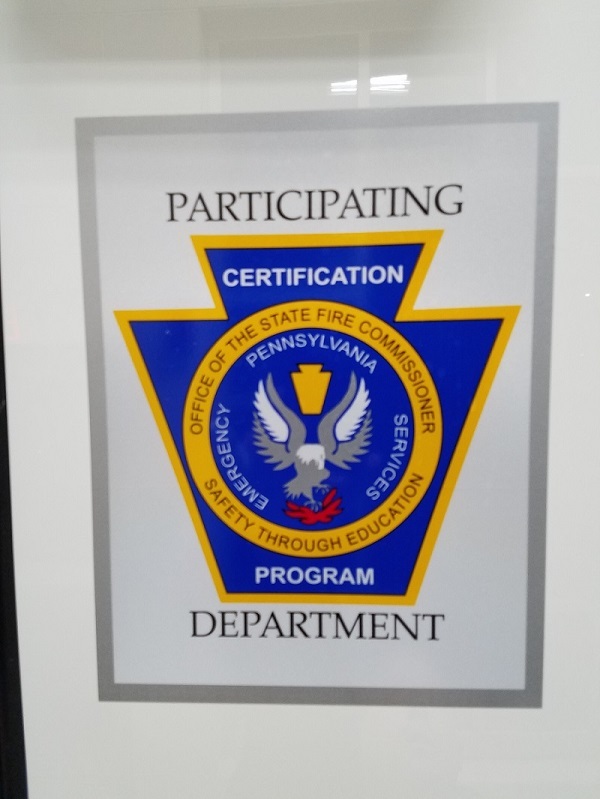 The Temple Fire Company was recently recognized by the PA Office of the State Fire Commissioner’s Office as a recipient of the Participating Department Recognition Program. The Participating Department is a program that Commonwealth emergency responders have an opportunity to participate in and be recognized as a certified fire professional at various levels in accordance with nationally recognized and sanctioned Professional Qualification standards. The purpose is to recognize those organizations that support, promote, and encourage their emergency response personnel to voluntarily certify within the Commonwealth’s Certification Program administered by the Office of the State Fire Commissioner. Company 11 has achieved the “Silver’ Status which means 75% of Department Personnel are currently certified within one of the accredited levels of the Office of the State Fire Commissioner Certification Program. This “Silver’ certification level has been achieved by only 75 departments in the Commonwealth. Company 11 is the ONLY department in Berks County to achieve this certification. Office of the State Fire Commissioner web page.